Shanghai City - visiting the Old Town, wandering along narrow streets, watching the preparation of food, tasting Chinese meals… including the traditional “flower tea”. Like most mega-cities, Shanghai does not sleep. Streams of cars, bikes, scooters seem to have no end….. streets are literally flooded by hoards of young people. With one child policy I expected to see more “age balanced” crowds. Soon I realized that grandparents’ generation usually wakes up early morning invading parks for a kind of gym, meditation or both. During a day you may see many of them taking care of grand-children (they have mostly only one:-(). That reminds me what is so great about grandchildren – we can enjoy time with them, please them with toys, ice creams (yeah, there are many ways to make them happy and smiling!)….. then at the end of the day we can send them “rotten-spoiled” back to their parents! The underground part of the Oriental Pearl TV Tower includes a very interesting Museum of Shanghai. To my pleasure, the large section of the museum is dedicated to the colonial past – capturing the lively atmosphere of what is mostly gone and forgotten these days. For some, this may refresh nostalgic moments, for me however was just the lesson of not well known history. I hope that the following "old Shanghai" pictures will successfully bring the atmosphere of the city’s colonial past. Knowing only the “westernized” North-American versions of Chinatowns I had quite high expectations entering the real one in Shanghai. To my surprise the Shanghai’s Old City, like most western Chinatowns has quite clear “demarcation line”. The old colonial architecture gives way to the Chinese style without any gradual transition zone. You cross an “invisible line” and then suddenly you are in the different world. Richly ornamented buildings with characteristically curved ceramic roofs and generous wooden decorations form narrow but bustling with life streets. Add to that picture -traditional red lanterns, here and there strange rock structures, water ponds and thousands of small shops where you can find everything from typical tourists’ oriented stuff to genuine and long-established Chinese goods – and you know, that this is the real Chinatown. It lives its own life, so different from what you find on the famous Nanjing Road. Red Lantern beautifully adds traditional accents to the Old Town architecture. For better orientation -the most right picture shows a terrace of the Old Tea-House on the left and the corner of the Yuyuan Garden on the right. Walking along the “Food Street” is frankly an event of its own. For me it was like a street of buffets but opened from their kitchens’ sides exposing all that can be eaten with pleasure, or “possibly” can be eaten (but with some amount of bravery) and what almost certainly I will not be able to swallow! 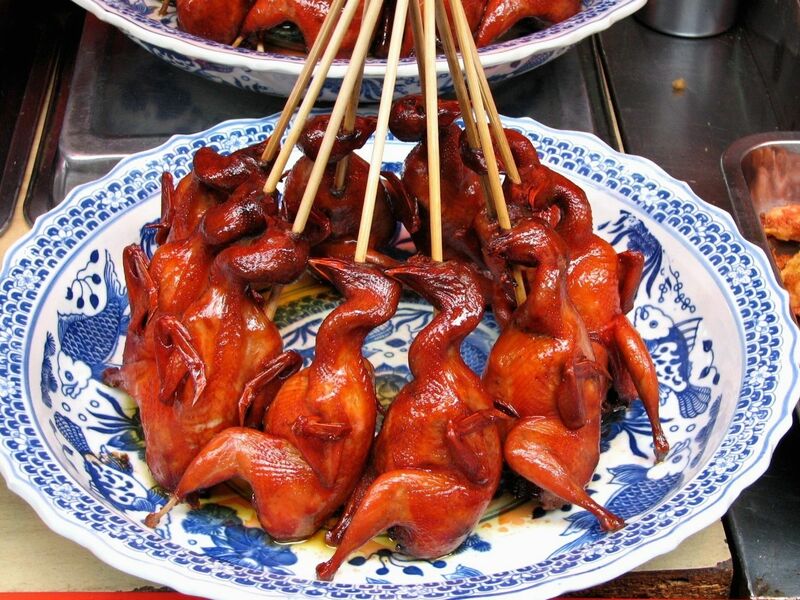 But regardless of all these feelings and prejudices – walking down the food street is a great experience as you can see on this mouth-watering picture from the Shanghai’s Old Town. Free Shanghai City Pictures: To eat or not to eat - that is the question! Old Town - view from the Old Tea-house on the surrounding area. Isn't it a different world? 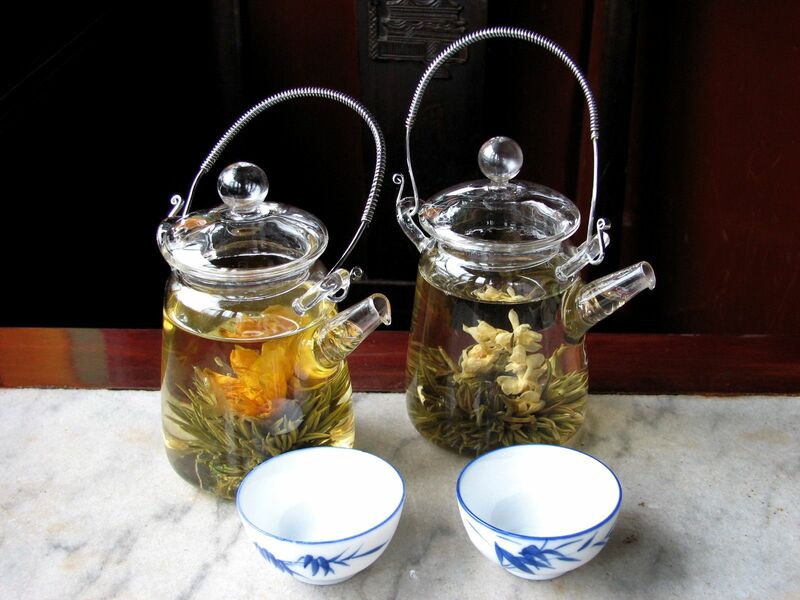 And when you sit by the window in the Old Tea-house, the best is still in front of you as you can see below. After the food tour we decided to taste some original Chinese stuff and tea seemed to be a “safe” choice. Well, this was also in recognition of the fact that China is the place from where the tea started its triumphant conquest of the world..
Time for the Flower Tea party in the Old Tea-house. 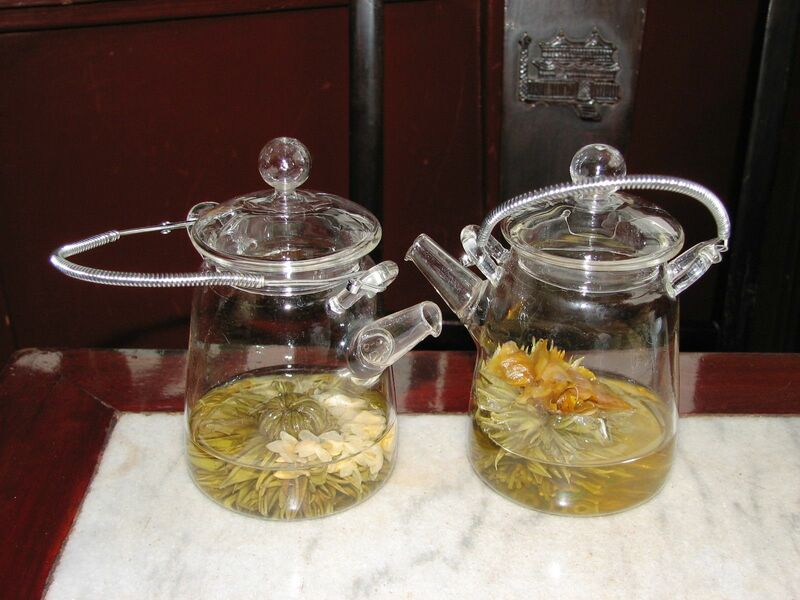 If you want to have a tea in the Old Town then the obvious place for this delightful moment is the Old Teahouse. 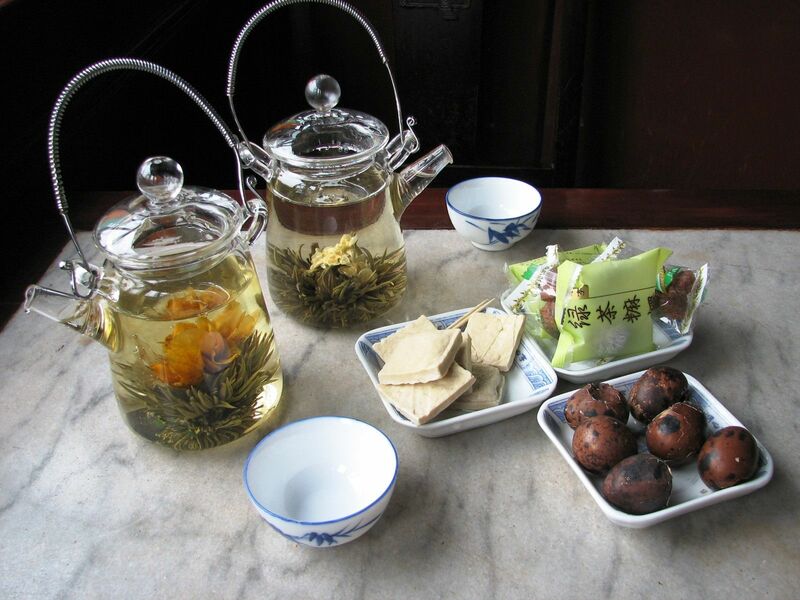 The Old Teahouse (Huxingting Tea House) known also by its pleasant-sounding name “Mid-Lake Teahouse” is the oldest operating teahouse in Shanghai. Originally the pavilion was part of the Yuyuan Garden constructed during the Ming Dynasty. For the first half of 18th century it served textile merchants as a place for business meetings and refreshments. Finally in 1855 it was converted into a teahouse (our thanks go to Emperor Xianfeng). Situated across the entrance to the Yuyuan Gardens, today it is a very popular place crowded with people appreciating its ambiance. Separated by the little lake from the surroundings of the Old Town and swarming hoards of tourists it offers not only the great variety of teas but also great panoramic views on the neighboring streets. As you may realize from the pictures, the tea-fiesta is an eye-catching event and I’m not even sure where from the biggest pleasure is coming – is it a visual effect or a sense of taste (I guess both are the contributing factors!). If you want to leave Shanghai, you can stop at another beautiful Chinese city of Guilin. You can tour this city of lakes, pagodas and parks, enter the marvelous underground world of Guilin Caves. Relax when cruising the famous Li River meandering along the extraordinary Guilin's landscape. And in the late evening watch the fabulous Impression Liu-Sanjie show on the Li River's waters (This is like the best Broadway show but in the nature). And DO NOT miss opportunity to see Giant Pandas and their distinct cousins Red Pandas by clicking: Giant Pandas --- and follow several pages.